Our STI has been driving around as a daily for two years now with all of the typical bolt ons. It has been reliable at 318 whp with good driveability and fuel economy on regular pump gas, in other words a hassle free car that is very easy to live with. Of course if good was enough, more is better and we could not leave good enough alone. One of the drawbacks of the EJ257 engine is that the bottom end is somewhat fragile and getting more power usually means more boost. We were close to maxing out the stock turbo and not willing to give up the daily driving convenience of 91 octane pump gas. We did not want to simply turn up the boost but rather make more power with the same boost and less backpressure so the turbo could run close to a crossover situation. With lower backpressure there is less reversion and less retained heat in the combustion chamber, the engine is happier, runs cooler and tolerates more timing which can also result in cooler conditions in the combustion chamber. Less backpressure can allow a cascade effect of more power with less stress on the engine as a system. It was time for an upgraded turbo. We just didn't want any turbo either. Yes we know that a rotated mount turbo system is best for power but we wanted to keep the stock location due to heat management and keeping some semblance of a stock appearance. We wanted a turbo upgrade that was a direct bolt in. 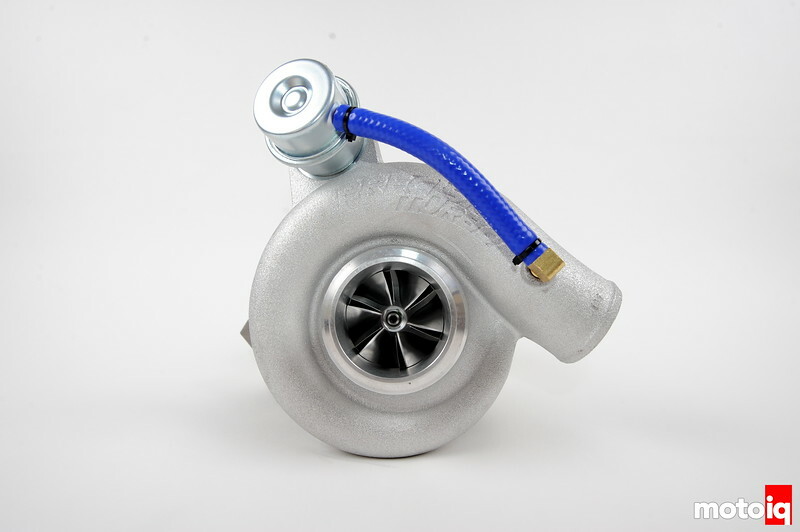 After studying the market, we found that Precision Turbo made what we were looking for, a totally engineered from the ground up stock replacement ball bearing turbo with the capability to make up to 500 hp. The Precision Turbo fits 2002+ WRXs, STIs and Foresters. We called up Precision and soon had a test unit in our hands. 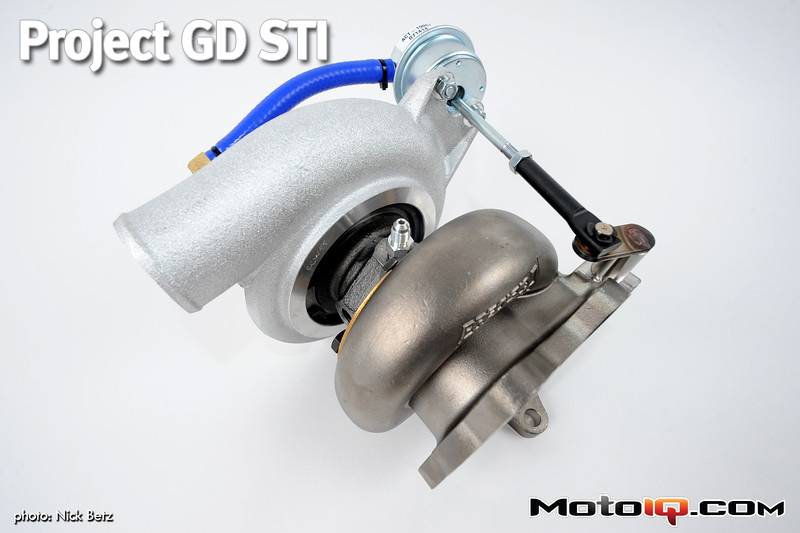 Read more about Project GD STI ! Other stock position turbo upgrades involve carving the stock compressor housing and stuffing larger compressor wheels in the place of the stock part. Yes this gets you more airflow and power but costs efficiency as the the larger wheels mess up the B height and diffuser configuration of the housing. 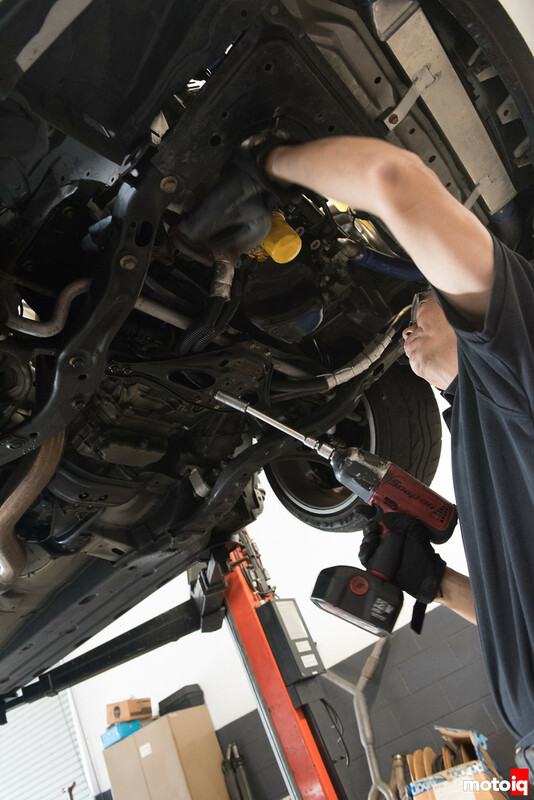 Less efficiency means more shaft power is needed to make boost and backpressure is created by the turbine when extracting the extra needed power from the exhaust flow. Less efficiency means more charge air heating and more lag as well. 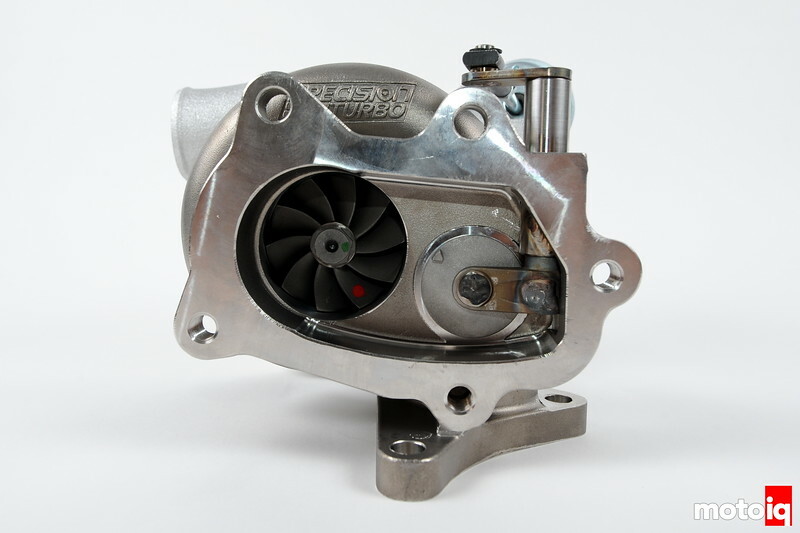 Precision's turbo has a CNC machined compressor wheel with a 55mm inducer. The wheel is machined from a 2618 low silicone aluminum forging. 2618 alloy is known for it's toughness and ductility. Machined wheels generally mean thinner compressor wheel blades and hub sections which further improves wheel aerodynamics and efficiency, Precision call this CEA or Competition Engineered Aerodynamics. The bigger compressor wheel is in an appropriately sized bespoke housing that was engineered for it. The bigger turbine wheel is also in a housing designed for it with a larger A/R for greatly improved flow. The turbine wheel is cast from highly heat resistant MAR-M alloy. The wastegate flapper valve is much larger to prevent boost creep. The nib on the flapper valve is an anti rotation feature as wastegate valves tend to spin and saw themselves loose if not constrained. Most direct drop in turbo upgrades are a larger wheel stuffed into the stock housing which again looses efficiency without optimizing flow. The housing is cast from stainless steel for it's anti rust and low thermal conductivity properties. The turbine shaft/wheel spins in a dual ball bearing floating cartridge. The ball bearing speeds spool and transient response and the floating cartridge damps out harmonics for longer life and quieter operation. The bearings are protected from coking by a water cooling jacket around the center section. To replace the turbo, Howard Watanabe first removes the intake charge pipe and the charge hoses to the turbo. He also removes the oil feed, drain and water lines to the stock turbo. Howard then removes the belly pan and removes the up pipe, unbolts the turbo, downpipe and exhaust manifolds. MotoIQ Pacific Tuner Car Championship presented by Motul, Round 7&8 Finals.